Social media isn’t just for the young folks, three quarters of adults are connected to one or more social media platforms. With the broad reach available on social networks, you’re throwing money out the window if you aren’t targeting potential new customers on this medium. However, once social media newbies start leveraging these channels for their business, all too often they make the marketing faux pas of failing to capture the email addresses of their fans, followers and potential prospects. Even though the number of active users on social media is constantly on the rise, 77% of consumers still prefer to receive permission-based marketing through email! That’s why it’s better to use the engagement you already have on your social media channels to convert fans into email subscribers, and email subscribers into customers. On top of email being the preferred channel of marketing communications, email outranks social media in regards to the control you have over your message. This is because some sites filter the content users see. For example, less than 16% of your fans will see the content you publish on Facebook. That’s why list building is the most powerful activity you can do on social media platforms. In this blog we are going to share 7 remarkable techniques to grow your email list through social media. Enjoy! As you build a company from the ground up, killer content surrounding your business and industry will probably be built along with it. This could be a blog series you wrote, a how-to guide or even a collection of tips you’ve gathered along the way. You can leverage this premium content on social media to grow your email list by using an opt-in form that someone must fill out in order to get your material. Think of the opt-in form as the gatekeeper between your guide and your reader. It’s a super simple quid pro quo that most readers are more than happy to oblige with. Once you click through, you are brought to a dedicated landing page where you submit your personal info (including your email address) to gain access to this guide. We leveraged this tactic at our company by taking a blog series we had already written and turning it into a marketing guide. It was as simple as creating an intro, conclusion, and a cover page for the pre-existing blog series and voila, we have an in-depth marketing guide on Open Rate Optimization! Chances are that on your website and in your email campaigns you’ve embedded your social media icons so your readers can easily check out your pages and follow you. The question is, have you made it as easy for someone to join your email list when they are on your social media platforms? A sign-up form is the simplest and most efficient way to maximize your social efforts by growing your email list. One easy way to allow people to join your mailing list is by embedding a sign-up form on Facebook. I only mention Facebook here because Twitter and Google+ do not currently have that capability, but more on that later! Having a sign-up form embedded on your page is advantageous because it keeps your fans from having to leave Facebook to sign up. Making it easy to join the mailing list should be your #1 goal. The easier it is for your fans to join your mailing list, the more subscribers you’ll have. Do note, there are many different ways you can go about integrating your sign-up form with your Facebook page. You can go through third-party applications to set this up or you may be able to do this easily through your ESP. 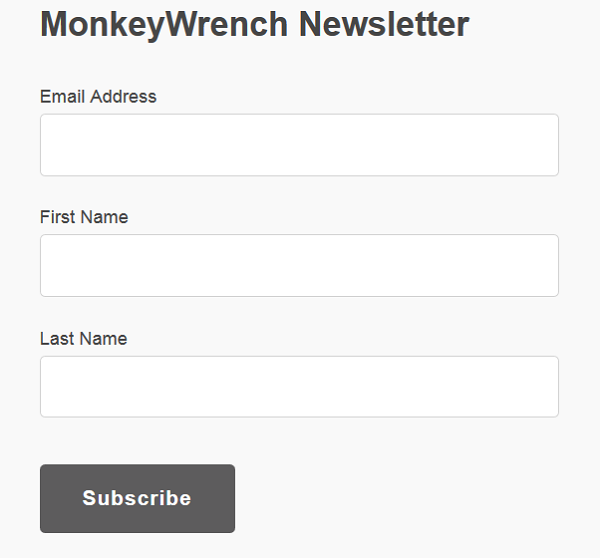 Check out MailChimp’s Facebook page below for a good example of an embedded sign-up form in action. They have their “Email Newsletter” tab prominently positioned so your eyes are drawn to this area immediately. Once you click on the newsletter tab, you are taken to a fantastically simple form to join their mailing list. Easy peasy. Sometimes, you gotta shell out some cash to get in front of your desired audience, so let’s check out paid promotional efforts on social channels next. Twitter and Facebook are fantastic places to easily target and reach a large number of potential fans. What’s even more fantastic? You don’t need to spend a ton of money ($5/day) to get your promoted posts and ads in front of your audience. These platforms also allow you to zero in on potential targets with ease. For example, on Facebook you can create ads that target people based on pages they have liked and on Twitter you can send highly tailored tweets based off of geographic location. You can even go as far as to upload your existing mailing list to Facebook so when you target your ads, you can exclude people already on your email list and hone in on those that are fans but not email subscribers. When you are creating a promoted post or ad, remember that the goal is to collect email addresses. The easiest way to do this is to make an ad with an enticing offer that links to a dedicated landing page that captures your targeted audience’s email address. A striking image should also coincide with your post to draw your reader in. 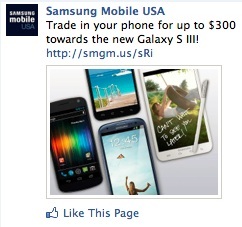 Here’s an example (right) from Samsung giving an appealing offer for users to get $300 towards their next phone. Paid advertising on social media is valuable because it multiplies your reach and gets you in front of people that may have never come across your company organically. If you are just getting started with setting up Facebook ads, hit the ground running here. 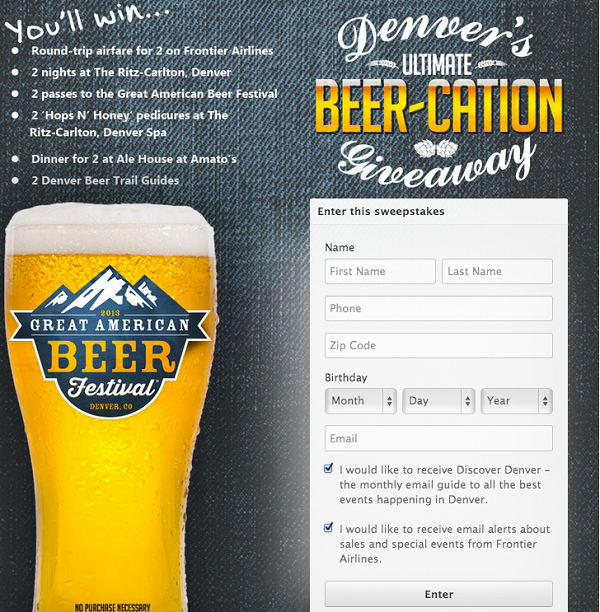 Sweepstakes and contests are fairly easy to make on Facebook and are a great way to engage and grow your list. I suggest you use a sweepstakes the first time around because the structure usually has someone enter just their basic contact information whereas contests usually ask for much more. Contests asks for things such as photos, videos, or an essay which ups engagement, but perhaps not list growth since it is more time intensive. Sweepstakes, which only require general contact information like name and email address will likely help your list building cause tenfold compared to a contest. Pinterest is a great way to represent your brand visually. In order to get someone to take action and join your list from your visual pin, be sure and create killer call to action within the pin. In our tip above we touched on running contests through social media. There are Pinterest contest platforms out there like Piqora and Curalate that you could leverage to host a variety of different contests that will capture email addresses. Since Pinterest is so visual, running a photo contest on here could be a great jumping off point. You also have the ability to make a fantastic pin for one of your products that visually entices your reader to click-through. For example, we offer advanced email analytics and reporting tools and could easily pin one of our detailed report charts so Pinterest users see exactly what our product offers. Click here to check out a great example of incorporating a CTA in the design of the infographic. At the bottom of this image, the website is clearly featured so viewers know where to go for more information if they like the content of the infographic. Unlike Facebook, Twitter and Google+ will not allow you to host a landing page or embedded a form in their platform. In order to get your sign-up form in front of your followers on Twitter and Google+, you can link to your sign-up form in your bio or about sections. In the example below, both the landing page and website she takes you to give you ample options to join her mailing list. This is a screen capture from Social Media Examiner’s article. Make it a point to integrate the link for your sign-up form in every “about” section, whether it be your website, a social media page or something entirely different! Just because it’s a very simple tactic, doesn’t mean it isn’t effective as well. Raise your hand if you’ve ever attended a webinar. Those of you who have already know it is completely standard to enter in your email address to register for this online event. Since submitting your email to attend a webinar is standard, you won’t get much pushback when requesting this info. A fundamental of social media is being able to share your content to get in front of a much larger audience, so sharing a link to register for your webinar will help increase your number of email subscribers. What’s even more beneficial would be if you shared your registration link in a promoted post on Twitter or an ad on Facebook to hone in on your desired audience. Say you were running a webinar that is selling a weight loss formula, you could target your ad for the webinar to people that liked particular fitness pages or other certain diet pages. This way you’re not only getting more eyeballs on your invite, but you are also getting more qualified eyeballs on it! Sharing your webinar registration link on social media platforms isn’t JUST limited to Facebook and Twitter. 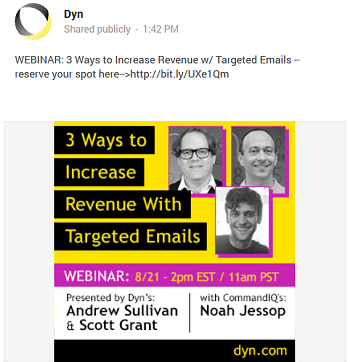 Check out this Google+ post (right) from Dyn. Clicking the link takes you to their landing page where they capture your email address in order to reserve your seat for the web event. They even leveraged a good image from their landing page and integrated it into the post to make it more visually enticing. How do you amplify the control and reach of your message? Every 60 seconds 120,000 tweets are posted, 510,000 comments on Facebook are published and 1,350 photos are uploaded to Instagram. With this rapid and constant flow of information, as well as content filters popping up all over social media channels, it’s hard to keep your brand front and center. Move conversation with fans over to email so you’re no longer competing with a sea of noise and then you can control the message. Did we miss any techniques or tactics? Comment below and share how you employ list building techniques through your social media!